The key, Dickeson says, is that the program lets you create, in just a few simple steps, a PDF portfolio that you can fill with any kind of file: PowerPoint presentations, scanned documents, video and audio clips, and so on. “The software compresses the files and puts a wrapper around them so it’s one neat little package,” she says. Dickeson can identify plenty of ways teachers can use digital portfolios, from showcasing classroom projects to offering evidence of their own performance. She trains colleagues in how to build a portfolio to augment a textbook or for a lesson that has no textbook attached. 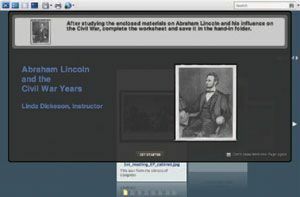 The teachers learn to capture Web pages, construct study guides, and incorporate videos. “You can put these into a curriculum portfolio to use again and again,” Dickeson says. Once their teachers get started, Andringa and Dickeson know, they’ll find even more uses for PDF portfolios. In fact, while Dickeson was conducting training at the Nebraska Department of Education earlier this year, the state director of technology suggested that she use a PDF portfolio as a pre-meeting organizer rather than send many emails containing many attachments. It probably won’t be too long before Dickeson turns that idea into a reality in her district.